The coming year promises a new chapter in the omnichannel customer experience, with technological advances reconnecting retail in ways that exceed expectations. The emerging retail solutions will be highly interactive, personalized and secure. Mobile point-of-sale (mPOS), beacon technology, digital signage and sentiment analysis will come together to create meaningful moments in retail, efficiently connecting to the ways millennials shop and work today. 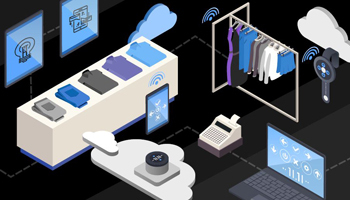 Stores are adopting beacon technology to pull data from shoppers’ devices and connect them to in-store purchases, bringing interactivity to the omnichannel customer experience. Picture, for example, a “click and collect” interactive experience in which a shopper saves a pair of boots in an online shopping cart using a store’s mobile app, and when they enter the store to pick them up, a proximity beacon recognizes the shopper and notifies a sales associate to deliver the boots. This interaction, triggered by the beacon, creates a new sales opportunity, engaging the mobile sales associate with a shopper whose tastes and interests have been identified. Digital signage will also play a key role in reconnecting retail. Billboards have long helped draw shoppers’ attention, but they don’t help at eye level. Digital screens on a sidewalk or in a store window have until recently had some limitations, not least of which that they can be hard to view in direct sunlight. But a new breed of daylight-readable LCD panels and direct-view LED displays are potential game changers in the arena of retail signage. Download this white paper for a free guide to creating the retail experience of the future. Tablets are increasingly being leveraged to provide a convenient, secure mPOS system to empower a more customer-driven sales associate, facilitating mobile transactions to reduce wait times. Tablets can also help sales associates better manage customer engagement through a breadth of information and transactional tools. Lastly, mPOS helps employees with inventory management and drives increased conversion and better customer retention. What does this look like in action? Suppose the shopper with the boots sees those boots as they walk through the store. Their phone lights up with information about the boots, while the system alerts a sales associate to approach and offer help. The associate can then use a mobile device with an mPOS system to help the shopper complete the purchase on the spot. To make the experience truly seamless, the shopper can make their purchase using Samsung Pay, carrying out a complete device-to-device transaction with the mPOS device. While that sale is being executed on the shop floor, smart technology is driving improvements in the retail back office. A store associate checks their sales activity for the day on their Galaxy tablet and collaborates with their manager to plan skills training. The manager can also use their tablet to review the day’s marketing data. All this correlates back to the customer to deliver a true omnichannel shopping experience. Imagine the shopper who can’t find a pair of jeans to match his t-shirt. He uses a touch screen in-store display to notify a mobile-enabled associate. Discovering that the jeans are out of stock, the associate pushes a comparable pair to the display, as well as to the retailer’s mobile app on the shopper’s personal device. The shopper executes the purchase via mobile device and has the product shipped directly to his home. The app recommends a sweater to complete the ensemble, and the shopper buys it in-store. This is the omnichannel customer experience in a whole new light, beginning with beacon technology and mobile apps, propagating through digital signage and ultimately driving back-office metrics and customer intelligence. What’s happening is not just the “next new thing” in technology. It’s a re-envisioned retail experience — driven by technology, but ultimately rooted in an awareness of the customer’s needs and a deep understanding of consumer behavior. In the future of retail, engaged shoppers, empowered sales associates and informed management come together to create a vibrant, interactive and personalized consumer experience. NRF Retail’s BIG Show, taking place in New York City on January 15-17, will showcase these innovative technologies and cutting-edge solutions set to shape the retail environment of the future.